Just Contemporary Romance: Touchy subject! Congratulations to "Jonetta", the winner of Abby's giveaway. Thank you to all who participated! One of the things I've read again and again about my debut novel, GOING HOME AGAIN, is that it's not your typical romance. While this is true, I think that's a good thing. After all, who wants to be called "typical"? Not me. I think one of the things that sets GHA apart is that it deals with some pretty touchy subjects that a lot of people don't like to think about. Namely, the end of a marriage and the guilt and self-doubt one would feel falling for a man who's already taken. It wasn't easy to write about, that's for sure! But that's the story my characters told me to write. I felt that I'd be doing them a disservice not to tell the story in the way that felt right just so I wouldn't ruffle any feathers or hurt any feelings. I myself am single, but I know some of my readers who are married have had a tough time with the story, because of how things go between my main characters while one of them is not yet divorced. One reader (and friend) even told me she'd had a similar situation with her husband, and they'd stayed together through it. I think that's admirable that they stuck it out. I think when a marriage is solid, it will work out in the end, and the couple will be stronger for it. The fact that a similar situation actually happened to someone I know makes it all the more satisfying for me as a writer. Although I love a good romance story with a happily ever after (who doesn't, really? ), I kind of pride myself on being realistic at the same time. I want people to see themselves in my stories, not some model on a cover or a skinny actress with perfect hair. I want them to recognize themselves and find that maybe, sometimes romance happens to real people, too. Real people in real situations face touchy subjects every day. As a writer, don't shy away from it. As a reader, don't shy away from reading it either. It may just turn out to be a more fulfilling experience than you imagined. When the chemistry between them ignites, Alyssa and Michael are hit with the harsh reality that he isn't yet free to love her. With Michael's wife and son still very much in the picture, can Alyssa hold out until he ends his marriage for good? Or will she risk it all for a second chance with the one who got away? 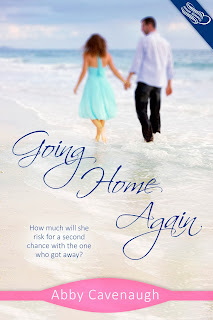 Abby will be giving away a digital copy of GOING HOME AGAIN to one lucky person leaving a comment or email entry. Abby Cavenaugh is a writer of romantic women's fiction and YA paranormal. She is a newspaper editor by day, but dreams of someday retiring to the North Carolina coast to write books full-time. She lives near Charlotte with her twin sister, also a writer, six-year-old niece and crazy cat, Gus, and is driven by dreams, Diet Coke and chocolate. Giveaway ends 11:59pm EST Dec. 22nd. Please supply your email in the post. You may use spaces or full text for security. (ex. jsmith at gmail dot com) If you do not wish to supply your email, or have trouble posting, please email maureen@JustContemporaryRomance.com with a subject title of JCR GIVEAWAY to be entered in the current giveaway. This is the ultimate touchy subject, one where there are minefields with every step. I read a similar story recently and it was tough to handle. As a married woman, I'm very uncomfortable with characters in relationship with another when a third person is still involved. I'm looking forward to seeing how your story handled the situation. I don't mind a little discomfort in my stories:) It just adds more layers and complexity to the experience. Thanks for sharing your book and the post.